Red velvet cake was not part of my holiday tradition in middle Tennessee. My mother made blackberry jam cake every year, and I’d never heard of red velvet cake until Ron made it for my Christmas party here in New York. After he died, Linda graciously assumed the mantle and has made red velvet cake every year since for the party. It’s really a chocolate pound cake with cream cheese frosting. What makes it red is a ton of food coloring. Linda has tried everything from beet juice to all-natural coloring, but nothing gets that lurid red except regular food coloring. If the thought of Red Food Dye #whatever bothers you, just use one bottle instead of two. This recipe is a little retro–I think it dates from the ’60s if not earlier. Now that red velvet cake and cupcakes are popular, I’m sure there are many variations. But this is the one I know and love. Happy Christmas from me, and a shout-out to the memory of Ron. Mix the dry ingredients into the wet mixture. Bake in a tube pan 1 1/2 hours at 300 degrees. P.S. 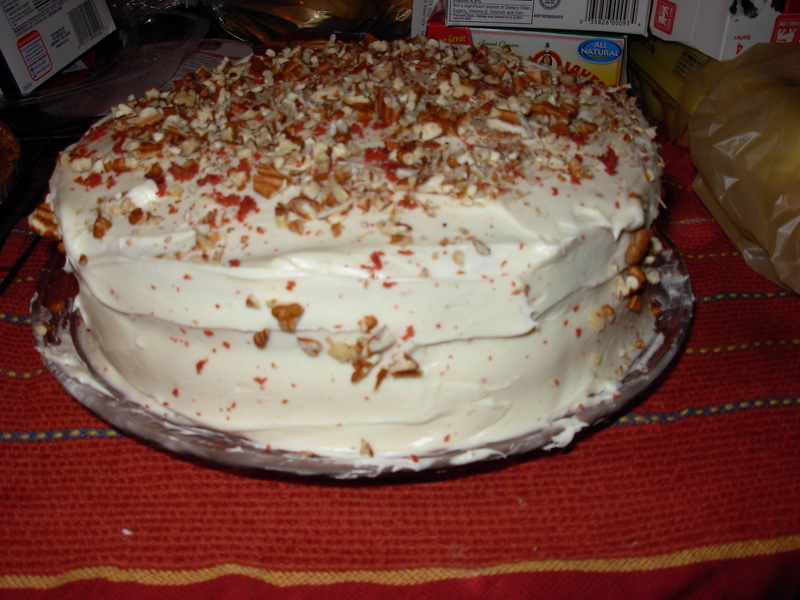 I got the photo from Wikimedia for a “Southern red velvet cake.” I never think to take a picture of Linda’s–too busy eating!